The Peterborough One World Dinner organizing committee is hosting the 32nd world's largest international vegetarian potluck dinner. The One World Dinner is a community and fundraising event held each February and organized collaboratively by the Peterborough New Canadian Centre, Jamaican Self-Help, the Kawartha World Issues Centre and the World University Service of Canada at Trent. This event provides community members with an opportunity to get together to enjoy an evening of delicious food and great entertainment. You won't want to miss out on the irresistible Raging Grannies, the outstanding TISA Choir as well as a dynamic Square Dance with Ken Brown, Curtis Driedger and caller Ben Wolfe. And as usual, there will be raffles and the highly competitive dessert auction. All proceeds from the dinner fund global education activities in the Peterborough area. Proceeds from the beverage table help to sponsor one refugee student each year to attend Trent University through the Trent International Program. The dinner takes place on Saturday February 6 at 5:00 pm at St Paul's Presbyterian Church. "The event is a unique gathering of people interested in building community, both locally and globally. 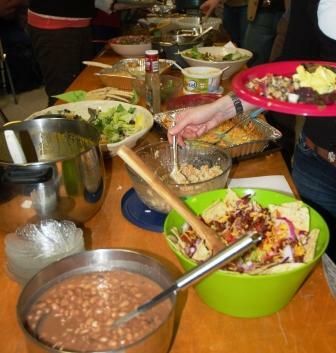 As a vegetarian potluck, the emphasis is on inclusion of people from all backgrounds while keeping our environmental footprint small," says Marisa Kaczmarczyk, member of the Organizing Committee. Tickets at the door are $5 per person or $10 per family (suggested), and everyone is aked to bring a vegetarian contribution to the dinner with a list of ingredients (no desserts or soup, however). Don't forget to bring your own plates, mugs and cutlery as well. Doors open at 5:00 pm and the dinner begins at 5:30 pm.